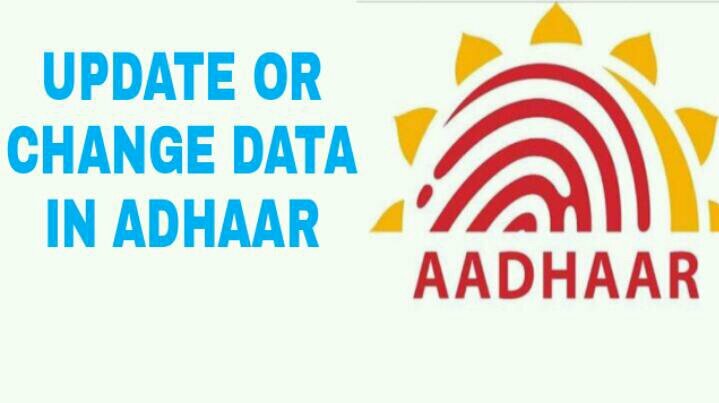 1 How to Change Name, Address, Mobile Number, DOB in Your Aadhaar Card Online or Offline? 3 How to Update Mobile Number, Name, Address, DOB in Aadhaar Card Online? 4 1.How To Change/Update Mobile Number? 5 2.How to Change/Update Name, Address, DOB? 6 How to Check Aadhaar Card Update Status Online? Aadhaar Card Correction Online– Hi guys, welcome back to avjtrickz. Aadhaar Card is now a very important part of our life. It plays very important role in almost every place and can’t be ignore anywhere. But many people’s suffering by the wrong details or minor mistakes on it. So we seriously look into how to correct the data online or offline. Read the full post to know how to do that. Have you registered someone else’s Mobile Number in your Aadhaar Card? Is it showing only the Year of Birth instead of full Date of Birth? Do you want to Change your Address in it? Is your name showing misspelt? Don’t worry update now without any risk! So How to Update or Change data Online? well, it’s easily possible using UIDAI Online Portal and here in this Guide, we will see the full steps to do that. DID YOU KNOW? As per DOT, you have to Link Aadhaar Card with your all the Mobile Numbers or SIM Cards to Continue using the Telecom Operators Services. We have written full step by step procedure on How to Link Aadhaar Card with any Indian Mobile Number easily. Before moving ahead, let’s first see the Basic or Primary Requirements for Updating or Changing any Details through online. Your Mobile Number must be register with your Aadhaar Card, If not you must see the offline process first see below this post. Need few Document’s Soft Copies (Scanned Copies) for Updating the data. Documents Required varies on the basis of the Data you have to update. Name Voter ID Card or PAN CARD or Driving License or Passport, etc. Address Vehicle Registration Certificate, Water Bill or Electricity Bill, etc. Date of birth Birth Certificate, SSLC Book/Certificate or Passport, etc. Follow the step by step guide to do Correction Online. How to Update Mobile Number, Name, Address, DOB in Aadhaar Card Online? First of all, 🔗Visit Aadhaar Card Update Online Page at UIDAI (Govt) Website. Enter your Aadhaar Card Number and the Verification Text you see on the image. Then click on Send OTP button. You will receive OTP on your Aadhaar Registered Mobile Number. Just enter the OTP and click on Login button. 1.How To Change/Update Mobile Number? 1.1: Select Mobile Number from the Options and click on submit button. 1.2: Enter the Mobile Number you want to Update or Replace with. 1.3: You will be sent OTP on the new mobile number. Just enter the OTP and submit it. 1.4: That’s it. Your Mobile Number Update Request is Registered. Note: If your mobile number is not registered with aadhaar card at the registration time, see offline method given below this post. 2.How to Change/Update Name, Address, DOB? 2.1: Select Name from the Options and click on Submit button. 2.2: On next page, enter your Updated Name/ Address / DOB in English and your Local Language both and Submit it. 2.3: Now you will have to upload verification Proofs for the respective change. 2.4: You will have to select BPO Service Provider or Agency who can verify your Documents. Select the Agency and click on Submit button. 2.5: That’s it. Your Name /Address / DOB Correction Request is Register successfully. 2.6: You will be given with a URN (Update Request Number) in each case. Just make note of it or store it somewhere. 2.7: In few days (mostly in 2 days) it will be updated. You can check the Status of your Update regularly using URN (see Steps to Check Update Status below). 2.8: You will get a new one via Post in few days. Till the time, you can Download updated e aadhaar card and use it. Now let’s check How to know the Update Status or track status Online. How to Check Aadhaar Card Update Status Online? Firstly 🔗Visit Aadhaar Card Update Status Check Page. Enter your Aadhaar Number and URN (Update Request Number) that you got when you requested for Data update. Note: The URN you got will contain Numbers with Slashes(/) in between but while you Submit it to Check the Aadhar Update Status, you have to enter URN without Slashes. Enter the Text/Number you see in the image and click on Get Status button. That’s it. On the Next Page, you will see the Status of your Aadhaar Card Update. It will show you when your request will proceed or when it will be completed. In case of failure of the request, you will be given the reasons and tips to submit the correct request. Is Aadhaar Card Correction Online without Mobile Number Possible? No, it’s not possible to do Aadhaar card correction online without mobile number since, through Online Aadhaar Card Update, your Identity has to be verified instantly right at the time. The only way is through Mobile Number Verification. If your Aadhaar Card isn’t registered then you won’t be able to do OTP verification online. Hence, correction through online without a mobile number isn’t possible. So you must follow below Offline method to register mobile number in Aadhaar Card, you can change any data also. First of all visit nearest Aadhaar centre. Then buy correction form from there. Then fill the form as per the instructions from the staff. Fill your Name, Aadhaar number and the data which you want to edit. If you didn’t register your mobile number, just fill mobile number in the respective column. That’s it, follow the instructions from the staff and wait for new card. If you have any doubt or facing any issue then you can Comment below. We will try to Help you out. Please share this article with your friends. What is e Aadhaar Card and how to download it? thanks admin when will i get my prize?